Experience the succulent flavour of Camel. Taste similar to Lamb but lower in fat. All our ¼ lb Gourmet Burgers are homemade from the finest ingredients for a delicious health alternative meal. Supplied fresh and packed in cartons of 2, 8 and 25. 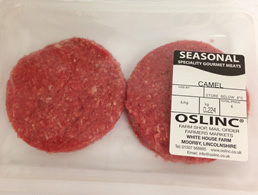 Camel meat is approved by the Australian Heart Foundation for its low fat content.